I zipped up my backpack when I heard my dad hollering. Oh, jeez, what’d I do now? He only uses that tone of voice when I’m in trouble. I couldn’t think of a reason. When I got downstairs I was surprised to find Dad sitting drinking coffee with Mr. Klosterman, the principal of Hillcrest High. “Uh, morning, Mr. Klosterman.” I looked at my dad and I’m sure he could tell I was confused. He stood, walked over to me smiling, and hugged me so hard it actually hurt. Now I was even more confused. “Oh... my God! I can’t believe it.” I’m going to Cal! I hugged Mr. Klosterman, which made him laugh, then my dad, hard. We all started laughing. What a great day! 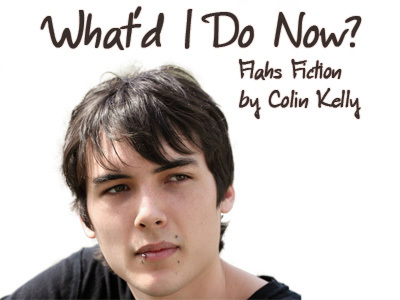 This story and the included images are Copyright © 2008 by Colin Kelly (colinian). They cannot be reproduced without express written consent. Codey’s World web site has written permission to publish this story. No other rights are granted. If you enjoyed reading this story, please let me know! Authors thrive by the feedback they receive from readers. It's easy: just click on the email link at the bottom of this page to send me a message. Say “Hi” and tell me what you think about What'd I Do Now. Thanks.